integrating spirituality and green design to find beauty in simplicity and balance. we design harmonious living and work spaces that resonates with clients from both the inside and out. Anjie Cho integrates beauty, spirituality and green design. She creates and enhances balance and harmony by designing spaces with an understanding of sustainability and informed by the ancient practice of feng shui. Her focus is to create a nurturing and supportive environment for each of her clients, at whatever level they feel comfortable. I've been doing some work in my home and am trying to apply western models of feng shui to my choices (as affordable and possible). I'm hoping someone can give me a little confirmation of what I believe to be true about my house plan. Or correct me, which would make things better and easier. 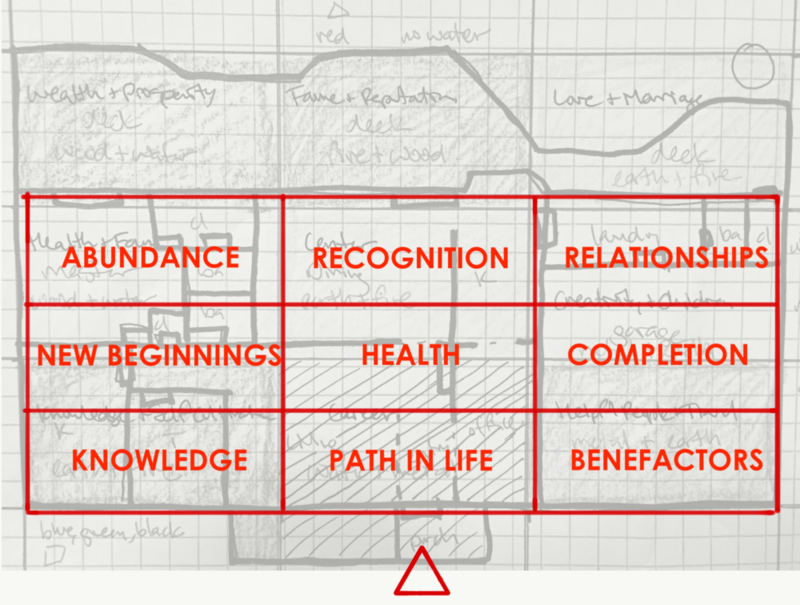 When I look at the bagua map over my house plan, the wealth, fame, and love areas are predominantly over the deck, which runs the length of the house. (The deck is 1/3 of the width of the entire footprint.) I'm not sure how specific these things get, as technically there is a small amount INSIDE the house, too. By the way, those three areas of my life are definitely works in progress. So my question is - am I right that the deck holds the three baguas? Until I have the resources to modify the space the way I really want to, what are some low-cost ways to improve the space? Thank you for any and all help! Thanks so much for submitting this question to our feng shui Facebook group: Your Feng Shui Journey. I encourage any other readers who would like to join. Your Feng Shui Journey is managed by my partner, Laura Morris, and I, as an extension of the Mindful Design Feng Shui School. Elizabeth, this is a great question about a floor plan that comes up a lot: is a deck included in the bagua? There is one main piece of information missing that I need in order to answer this question: is your deck under the main roof of the house, and is it under any kind of roof at all? A trellis would not be included as a roof. If the deck is under a roof, you have laid the bagua appropriately. However, if the roof ends before the deck begins and doesn’t cover the deck, as I’ve shown in the diagram below, the deck is not included in the bagua. You’ve also pointed out that there is an area, which appears to be on the right, in the Relationship area, that is part of the deck but is also part of the house. I’m assuming this area is under the roof, and the remainder of the deck is not. But even if the landing area isn’t under the roof, the bagua layout in the drawing here is still correct, as that area would be a weak gua, since it is exterior to the house. A roof over the deck, even if it’s in the house, would make this area stronger. You also mentioned that Abundance, Recognition and Relationships are the areas where you most need improvement in your life. Don’t worry! Most people find this to be true. These are the most areas of the feng shui map people usually want to improve, their wealth, reputation and partnerships, so you’re not alone in that respect. However, it may not be as dire as you think! If the bagua is laid out as I’ve drawn it, your exterior deck is providing some support in these areas! What could be the most challenging area is what looks like the landing area, which is a weak spot in the Relationship gua. Your second question is, until you have the resources to modify the space the way you really want to, what are some low cost ways to improve the space? Feng shui doesn’t require you to modify your space and spend a lot of money. This is a common misconception. There are a lot of resources available for free online, and you can do your best with those or purchase a book. I would just recommend you follow one person and not get all mixed up with a lot of different teachers. Pick the one book that really resonates with you, use that and do one to three things that you can put all your energy and attention into. Focus on that, and maybe one of the three areas you mentioned having issues with, and do those things really well instead of feeling like you can’t do what you really want. In fact, you can! You have all the tools you need; just select one free resource, follow that resource really well and do your best. Mindful Design is a new way to learn feng shui. Our a unique training program takes an holistic approach to learning the art of feng shui design. Mindful design is about becoming aware, and attentive, to the energy around you: both inner and outer qi. It is about promoting a better way of living and creating sacred spaces that support, and nourish. Visit us at mindfuldesignschool.com. Thanks for reading our "Q&A Sunday". We will be answering questions submitted by our readers. Click here to submit any Feng Shui or Green Design questions! 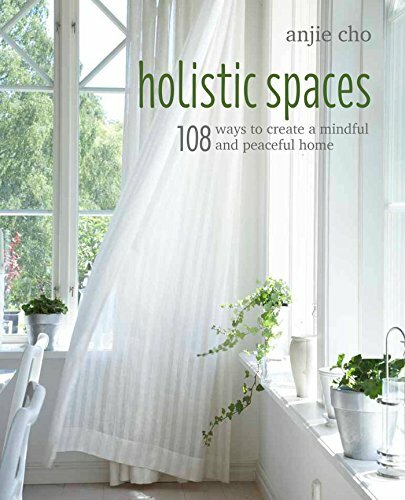 Sign up with your email address to receive news, updates, and a 10% off coupon to the Holistic Spaces Store! Anjie Cho Architect is an architect and feng shui expert, founder of Holistic Spaces. Creating beautiful and nourishing spaces for living.